In 2001 Mary Kay and I were on the homestretch from Santa Barbara--- up the coast through Pismo, SLO, Cambria and then along Big Sur to Monterey Bay. The purpose of the trip was a search for a beach get-a-way, a little piece of solitude where we could enjoy nature on weekends, holidays and hopefully in retirement. We continued north to Mendocino and from there up the long and beautiful Oregon Coast. Cannon Beach was our last stop before going home empty-handed to Seattle the following day. We were frustrated and pessimistic since we had found nothing suitable in over 1000 miles. We debated whether one more visit to one more realtor was worth the effort. He opened the door and stood aside, out of the way, as the view drew us like a magnet to the two-story windows that faced the ocean. Both Mary Kay and I realized that we had been had. It was the classic Duane Johnson under-sell--- and the following morning we bought our dream house and a few years later we purchased the adjacent lot. All transactions went smoothly and we enjoyed our beach home for 17 years. 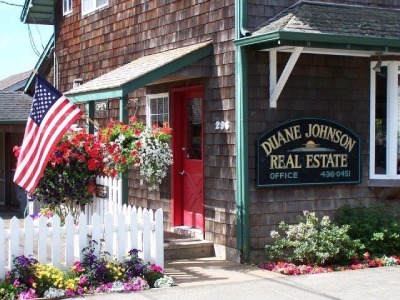 Anytime I tell someone of the sale of our Cannon Beach home, I automatically include “we had the greatest realtor”! From the moment we met Michael Henderson in the Duane Johnson Real Estate office, the experience of selling our house was incredibly enjoyable and smooth. He helped eased the bittersweetness of leaving such a wonderful location. Michael secured us a signed sales agreement in 6 weeks instead of the year I expected it to take. Here is the most recent example of his resourcefulness: days before closing, there was a small repair I wanted to make. My normal channels were completely unavailable. Michael connected us with a licensed contractor to make the repairs within hours. I could not have been happier. They did an excellent job and at a very reasonable price. Then, there are all the details he so excellently attended to during the listing, viewings, contracting, closing and moving process. As my husband said, Michael “went above and beyond the call of duty!”. His knowledge of both the realty and building industries is outstanding. For example, he has experience with home building that plays perfectly into issues that can exist in any residential dwelling. He always made sure our home was well treated during viewings, for example, respecting our shoes-off policy. He helped us find new homes for many of the items we no longer could use. His patience and understanding greatly reduced the pressure of selling our beloved home. Michael was always available for us, any time of day, any day of the week, by phone, text and email. I have a new appreciation for the life of a good realtor! His expertise was very impressive when it came time to work on the sales contract. For example, he eased us through a counter offer and all the details therein. It is with my great pleasure and gratitude that I share my comments on my experience with Michael Henderson, agent with Duane Johnson Real Estate, in the purchase of lot 13 located in Castle Rock subdivision at Arch Cape. I was introduced to Michael by a very good friend. I live in Bradenton Florida so my communication with Michael were by phone, e-mail, and text regarding the purchase of the property. I explained to Michael what I was looking for and that was a investment/vacation / future second home site. With Michael expert knowledge not only did he take full charge he found me exactly what I was looking for a beautiful ocean view property. The experience at each phase of the purchase effort was superior; I appreciated his professionalism, attention to detail,solid great work, and his timely status updates, and dedication to get the job done from the beginning and throughout the closing process.